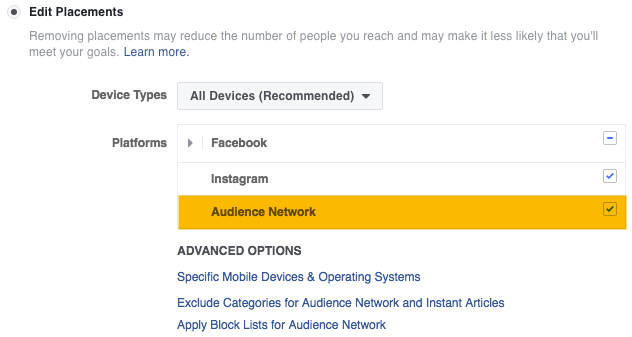 Automatic Placements-Facebook automatically selects the recommended placements your ads are eligible for, depending on your objective and creative. This is the default option. Edit Placements-You manually choose your placements. Although Facebook offers six placements, your ads may not be eligible for all placements since eligibility depends on your advertising objective. For example, if you chose the objective Mobile App Installs, your ad will be eligible for placement on Instagram, mobile news feed, and Audience Network and ineligible for placement on desktop news feed and right column. If your ad is ineligible for certain placements, it should say “ineligible” next to your placement. 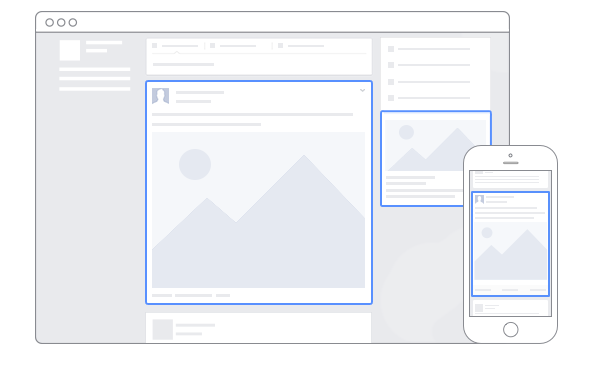 Here’s everything you need to know about each Facebook ad placement. 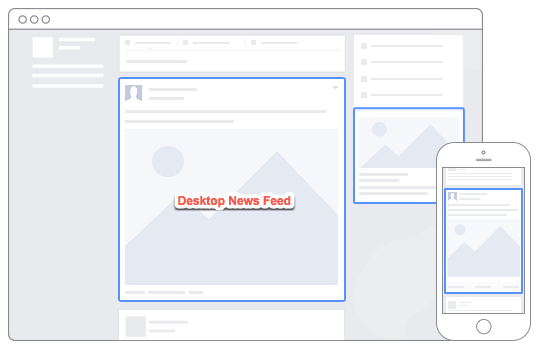 If you choose to place your ads on Facebook’s desktop news feed, your ad will appear on news feed, the section of Facebook where posts by your friends and family appear. It’s important to remember, however, that placing your ads on desktop news feed means your ads will only appear on news feeds accessed through desktop devices, including laptops. Do not confuse this with mobile news feed, which is accessed through mobile devices. Your news feed ad will appear amongst posts by friends and family, lending it the appearance of a regular Facebook post rather than an ad. Many favor desktop news feed ads because their resemblance to regular posts makes them more appealing to Facebook users. According to consumer surveys, people hate intrusive ads, including pop-up ads and video ads that play automatically with sound on. Desktop news feed ads, on the contrary, blend with its environment and does not interrupt the user experience. When you choose to place your ad on Facebook’s mobile news feed, your ad will appear on the news feed people access through mobile. Much like desktop news feed, your ad will appear amongst your friends and family’s Facebook posts. Because news feed fills up a phone screen and because posts appear on phone screens one at a time, people have no choice but to look at your ad when it appears. Unlike the desktop news feed, there is no left sidebar or right column to distract the eyes. As of December 2016, Facebook has 1.23 billion monthly mobile users. Of those 1.23 billion users, 1 billion access Facebook only through mobile. Objectives eligible for this placement: Clicks to Website, Event Responses, Local Awareness, Mobile App Engagement, Mobile App Installs, Offer Claims, Page Likes, Page Post Engagement, and Video Views. Right column ads appear on the bar located on the right side of Facebook, sandwiched between news feed and ticker. 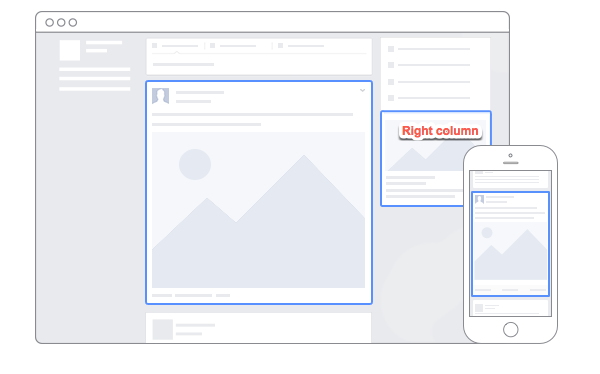 Unlike news feed ads that assume the appearance of regular posts, right column ads, which only show on desktop, appear in their true form—an ad. Objectives eligible for this placement: Clicks to Website, Desktop App Engagement, Desktop App Installs, Event Responses, Offer Claims, Page Likes, Page Post Engagement, and Website Conversions. Because right column ads are smaller and appear off to the side rather than front and center on the screen, right column ads are less invasive. If you don’t want to annoy people with your ads, if you want a subtle approach to advertising, then you should choose right column as your placement. When you serve your ads to Audience Network, your ads will appear on the apps and websites of Facebook’s publisher partners. Recently Facebook announced that advertisers can reach 1 billion people through Audience Network and that is has recently included several new partners, including Univision, Washington Post, Wenner Media, Daily Mirror, BBM, among many others. Serving your ads to Audience Network increases your reach. Not only will you be able to potentially reach Facebook’s 1 billion daily active users, but you can also reach Audience Network’s 1 billion users. Audience Network allows you to advertise beyond Facebook, on website and apps that people frequent. Instant Articles is a feature that makes articles accessible through mobile apps. When Facebook users click on an article, the article will open within Facebook’s app with similar formatting to the article on the publisher’s website. Choosing Instant Articles will place your ads within the article Facebook users are reading. Often your ads will appear between paragraphs. Placing ads on Instant Articles allows you to make your product omnipresent in your customer’s Facebook experience. Not only will your ads appear on Facebook’s desktop and mobile news feed (if you choose to do so), your ads will also appear on the articles your customers read from the app. Using Instagram as your placement means your ads will appear on Instagram’s feed, amongst the posts of other Instagram users. 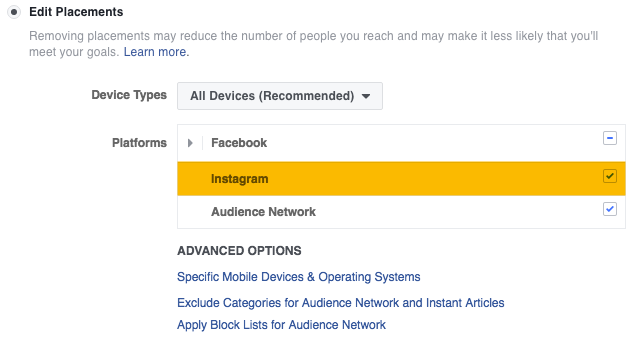 Note that Instagram does not support all of Facebook’s ad formats. While single image, video, and carousel ads are eligible for placement on Instagram, canvas and slideshow ads are not. Objectives eligible for this placement: Clicks to Website, Mobile App Engagement, Mobile App Installs, Page Post Engagement, Video Views, and Website Conversions. If you want to tell your brand’s story at the center of visual representation, then Instagram placement is recommended for you. Instagram is filled with visually driven content. Instagram currently has 400 million monthly active users worldwide, spending approximately 21 minutes on its feed a day. Keep in mind that you can choose more than one placement at a time. Doing so is highly recommended because it allows you to reach a wider audience. However, to know which is the most lucrative placement for you, always A/B test and analyze your results. Some brands may find more success on Instagram and less on Facebook. Some may receive more conversions on desktop than on mobile. Test and see what works for you. 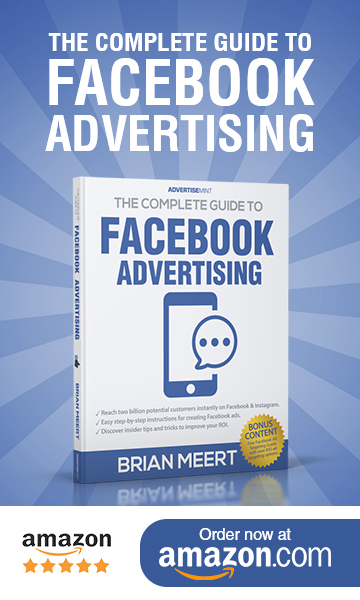 Was this guide to Facebook’s ad placements helpful to you? If so, share this link to friends. If you have any questions, comment below and we’ll respond to you as soon as possible.